Baylor is incredible. The Bears are huge. They’re like giants who roam the earth just taking whatever they want from others. Why would anyone even think they can play with them? Does Oregon stand a chance? Baylor is the best team in the nation this year, but they’re not unbeatable. Much has already been written about the Bears’ size and how to defeat it. Shoot over the top, stay out of foul trouble, blah blah blah. Here’s what to watch for and how Oregon might counter it. The Bears are 35-1 for a reason. They’re winning by a ridiculous average of 38 points per game in the tournament. And while Oregon winning would be an upset, they don’t have to play perfectly, they just have to do most of what’s below. Three-point shooting is important for Oregon, but to do it the Ducks need to move the ball inside out and side-to-side. This forces Baylor’s post players to constantly re-establish defensive position. I’m sure you’ll still see plenty pick and rolls with Sabrina Ionescu, Satou Sabally and Ruth Hebard, but you might see more lateral ball movement than normal to create gaps in the Baylor defense. 6′ 7″ Kalani Brown dominates on defense and on the boards. To score consistently against the Bears, Oregon needs to do many of the same things they did against Mississippi State, times two. Baylor has not one, but two legit inside forces in 6’7″ All-American Kalani Brown and 6′ 4″ Lauren Cox. The Ducks needs to make them defend multiple times on each set. Further, Oregon simply has to hit three-point shots. You expect Ionescu and Sabally to hit a few. The X factor here is Erin Boley, who hasn’t been hot of late. The Ducks need her to stretch the floor. They probably need about 3-4 threes from Boley to force Baylor to defend the whole floor. 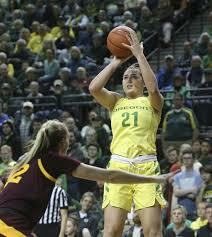 Of note, Oregon leads the nation in three-point shooting percentage at 41%. Baylor is ranked third nationally, shooting at a 37% clip (115-304). But Oregon shot almost three times as many threes as Baylor (362-869). Boley’s three is a key. For Oregon the three is critical. The Ducks use the shot to stretch the court and create space for their post players to get work done inside. Boley needs to set her feet and not rush the shot. At 6′ 1″ she’s got the size to get it off and her natural release is plenty quick enough. It looks like she’s eager to get it out of her hands sometimes. She’s also one of those shooters who needs to see it go through the net and then she’s terrific. They might be smart to use her passing ability at the high post early, get her some touches and ease the pressure of feeling like she has to shoot whenever she touches it. Don’t Foul Early and Block Out! Baylor isn’t a good rebounding team or even a great rebounding team; they’re an elite rebounding team. They’re the nation’s best and it’s really not even close. Oregon needs Hebard to keep Brown from killing them on the glass, and everyone else must step in and help. And they need to do it without fouling. Baylor’s likely to go right at Hebard to try to get her in foul trouble. 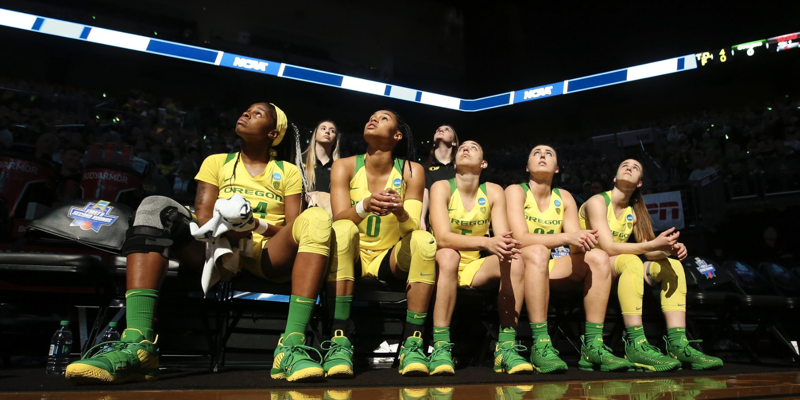 Hebard and Gildon need to rebound well for Oregon to make the title game. Hebard needs to put her hands straight up and take her chances. Oregon can only hope the referees let them play a little when fighting for position. Sabally and Ionescu need to grab a couple more boards than they normally do, and the other key here is Oti Gildon. Gildon’s rebounding tends to disappear at times and it can’t happen in this Final Four. 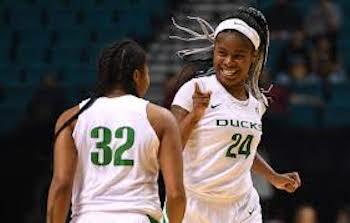 The Ducks need her to be active, keep Baylor off the offensive glass and grab at least 4-5 rebounds. If Hebard or Sabally get into foul trouble her role expands immediately. I thought she had disappointing games in the regionals, but she can be a difference maker this weekend. Rebounding always keys the fast break. Baylor’s big players can’t block shots and crowd driving lanes when Oregon is running. If the Ducks can consistently rebound on the defensive end, they should push the tempo every chance they get. Throw the ball to Hebard in the post and let her work early against Brown to get a foul or two. Hebard has quicker feet and rather than try to pump fake or go over (not possible), the drop step, step through and pivot moves are her best bet. She’s got terrific feet. Baylor’s Didi Richards is really quick laterally and has one of those non-stop motors that seemingly puts her everywhere at once — the kind of player who doesn’t need the ball to affect the game. Richards is good enough defensively to shut down Boley or give Sabally fits. Ionescu is terrific in crunch time of close games. 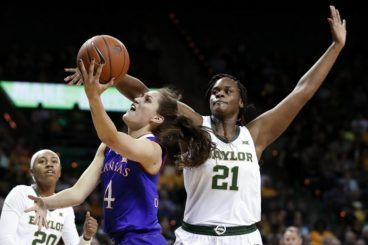 Baylor may have no answer for Ionescu. As good as the Big 12 is, Baylor hasn’t faced a guard who was able to pull up in the lane or get to the rim, make the right pass or hit the three at the level of Ionescu. They may even put Richards on her for stretches just to try to keep her out of the lane. That match-up would be a terrific game within a game. Bottom line, Baylor has more size and a better defense. Oregon scores it better and needs to hit threes. Oregon is about three times better than anyone the Bears have faced so far in the tournament. If the game is close at the end, remember Baylor hasn’t played a tight game in forever … the last game they played that was within two possessions at the end was February 4th at Texas, a six point Baylor win. Their only loss was at Stanford on December 15th when they shot only 19% in the first half, and they still only lost by five. That’s what all the extra possessions from rebounding will do. This is a tough task. If Oregon rebounds, takes good shots and runs they’ll be in it at the end. 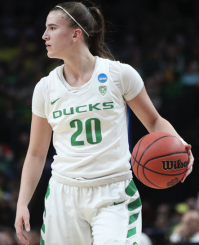 We all like the Ducks’ chances if Ionescu has the ball in her hands to decide the game. Men’s recruit Cole Anthony cut his list to four programs: Notre Dame, North Carolina, Georgetown and Oregon. I think he’s UNC bound. Oregon’s definitely looking for a grad transfer. I expect Kenny Wooten back and Louis King’s return is probably 50/50. He’s unlikely to be a first-round pick even though he’s clearly more ready than Troy Brown was last year. But there’s a reason that Brown left early last year and didn’t wait. This year’s draft is deeper. Talk of Payton Pritchard leaving early is just silly. He’ll be back. He’s not on a single draft board you can find. He’s a terrific college player, but he’s not leaving early to go play in Europe or be an undrafted rookie. I expect one transfer. It happens every year and while I haven’t heard anything specific, I have a hunch that one player might move along. Hopefully not; having experienced depth is critical to making deep runs in March. A great freshman is still often overmatched when facing an experienced upperclassman (see Ehab Amin in the tourney).